I wrote a couple of poems today! The first one is something I woke up with. Seriously, I was writing this in my dream after I had a dream in that dream about writing it, so I woke up (I think I’m awake that is) and wrote it down because it seemed the thing to do. How extremely meta is that? The answer is, of course, freaking extremely meta. The second one I’ve wanted to write for a while. I got this amazing fortune while eating birthday sushi in the park back in April. (Mmm… birthday sushi.) Anyhow, after reading it I realized that it would be a great prompt for a story or a poem. I chose poem. rest only in my dream’s embrace. 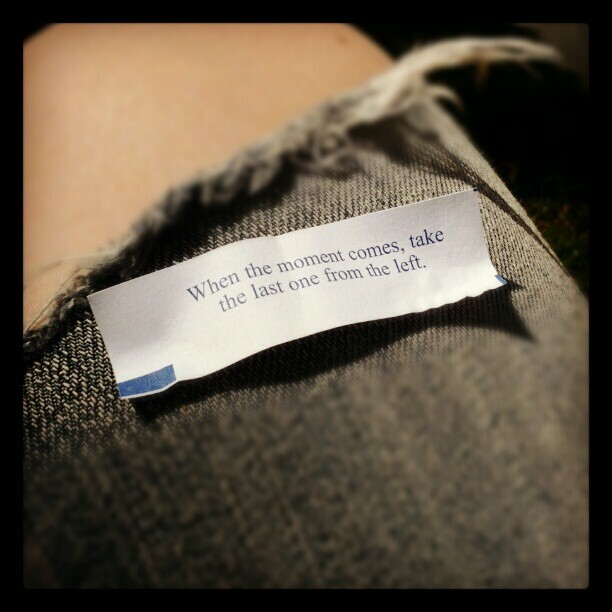 Hey, Loved your interpretation of “When the moment comes…. ” I was in a Chinese restaurant with my parents, and my Dad got the same fortune. We were confounded, and it was for this reason that I ended up finding your site. Write on!